Sizes Range from 8" x 8" to 2" x 2"
Plastic platforms, display risers that showcase products elegantly are ideal for use in commercial locations. 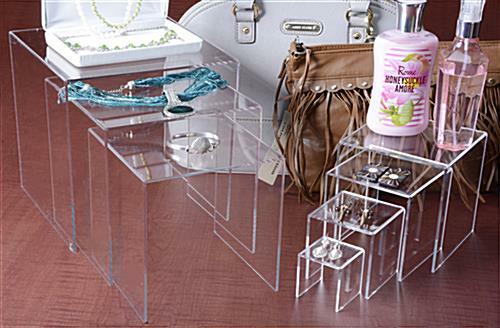 Business owners use acrylic shelves to exhibit products such as memorabilia, antiques, figurines, doll collections, model cars, hand bags, perfumes and more. 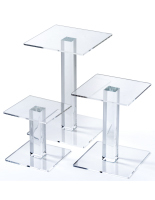 Display risers include (7) sizes of platforms ranging from 8”w x 8”h x 8”d down to 2”w x 2”h x 2”d. Each set can be arranged according to the user’s needs to create a dynamic and effective presentation. 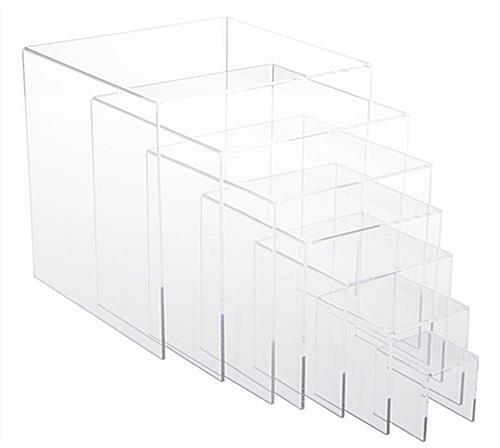 As an added bonus, these acrylic shelves are priced inexpensively with the option to purchase in bulk quantities for extra savings! The wholesale pricing of these jewelry showcasing tools is a great benefit to commercial establishments. 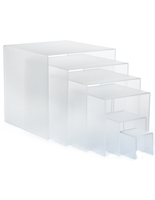 Display risers provide an eye-catching marketing solution. 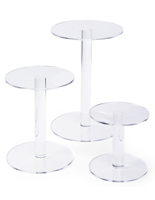 Many home owners use this jewelry stand to organize accessories in a closet or on a vanity. 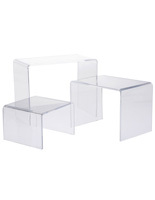 Display risers are ideal for showcasing individual items and are great for residential use. 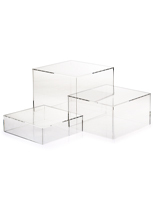 The plastic cubes provide an elegant exhibit for collectibles and special accessories. These display risers that are attention grabbing are commonly found in boutiques, toy stores, antique shops, malls as well as in residential settings. Store fixtures like these plastic pedestals have been proven to be a highly effective marketing tool for boosting sales in business. 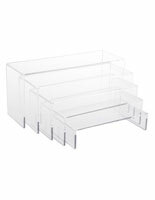 Display risers, also called raised platforms, can be placed inside of larger glass exhibits for precious merchandise not meant to be handled. Each stand provides a classic presentation for store items while embellishing the décor of any environment. Display risers are a great way to bring attention to merchandise. Purchase a retail fixture today! 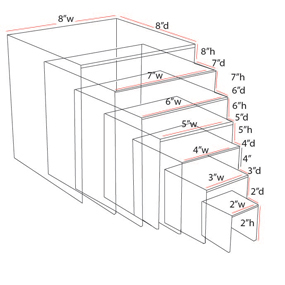 *One unit includes set of (7) risers. 8.0" x 8.0" x 20.0"
Perfect for the display of items at our auction. Product was exactly as pictured and described and arrived in excellent condition. We're so glad to hear these display risers worked out well for your auction, Tom! Thanks so much for letting us know what you thought. We hope you shop with us again soon! One of the outer cubes arrived broken, but D2G replaced immediately at no charge - great customer service! Nice looking product. We use these pieces for our sushi displays, it really lets the food stand out! Hi Katie, What a great idea for these risers. You're making us hungry for sushi! Do you have any pictures of your set up? We'd love to see it! Great product and service, my items were perfect for a project I was working on. That's excellent, Johnny! We're so glad to hear you're satisfied with your order. We look forward to working with you again soon!